Friday night my school hosted an art exhibition in the Center for Cultural Decontamination (Centar Za Kulturna Dekontaminaciju). The CZKD is a private institution that was formed during the Wars of the Yugoslav Seccession in 1994. The purpose of the organization was to combat the xenophobia, hatred, and general chaos of the war years with the promoting of the fine arts and intellectual freedom. 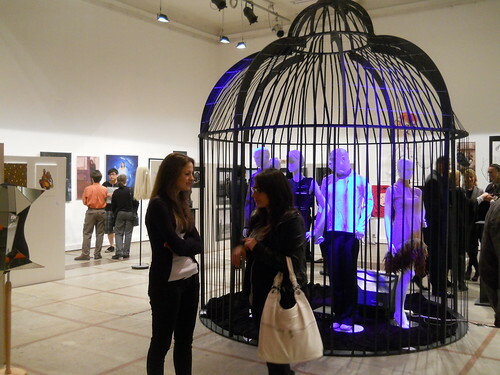 It was a very appropriate venue for the International School of Belgrade to host our IBO Visual Arts Exhibit. Our mission is to promote Open-Mindedness with our students. Many of our Serbian students are the future economic and social leaders of the nation. It also shows how far Serbia has come since those dark years. I thought the works of art were the best in my three years in attending the exhibition. The CZKD has a great building and location. It is housed in renovated old warehouse that has a large gallery room, meeting rooms, and a quaint outdoor courtyard. 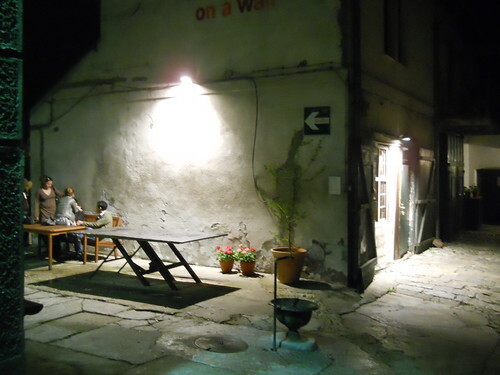 It is next to the Italian Embassy a couple of blocks up the hill from Knez Milosa Street. In visiting their web site, I see that they have a full program of events. I put a permanent link in my cultural links column on the right side of the blog. I hope they have some English-language events.